7 SUCTION CUPS: Seven powerful suction cups uniquely help eliminate common and irritating pillow slippage to create the most relaxing bathing experience. LUXURIOUS COMFORT: Ultra soft and smooth to the touch with more than 2 of luxurious padded foam. LARGE 2-PANEL DESIGN: This pillow measures 14.5 in x 11 in and features a thick, 2-Panel design that helps support both your tired neck, shoulders and back as you recline in your tub. TOP RATED DESIGN: Fits any size tub, spa, or jacuzzi. Easy to wipe down and keep clean with waterproof and nonporous surface. GUARANTEE: 10 year NO QUESTIONS ASKED 100% refund guarantee (no hidden fees). A warm bubble bath after a long, tiring day is something to look forward to. Who wouldn't want to have a spa-like bath in the comfort of your own home? Make your bathing experience even more relaxed and inviting! Pamper yourself and revitalize in the tub with our luxurious Soothing Company Bath Pillow. Our bathtub pillow is the perfect solution for a cold bath tub that makes your neck and shoulders ache. Helps you relax and get rid of stress. Perfect for anyone and fits in any size tub, spa or Jacuzzi. Durable and strong. It doesn't rip and tear like other bath pillows. Designed to make bathing comfortable and relaxing, a must have accessory for bath time. It resists mold and mildew, so it always smells fresh and clean. Simply slip the pillow inside its protective wash bag (included), then drop it into the washing machine. The Soothing Company Bath Pillow is designed and built to last, and we are confident that you will love it. It will add comfort and extend your baths or your MONEY BACK. Simply let us know and we'll give you a 100% refund or replacement. This is truly a luxury addition to your bath accessories, and it makes a great a gift for friends and loved ones. AIR-MESH TECHNOLOGY. It makes our bathtub pillow stay cool and comfortable. 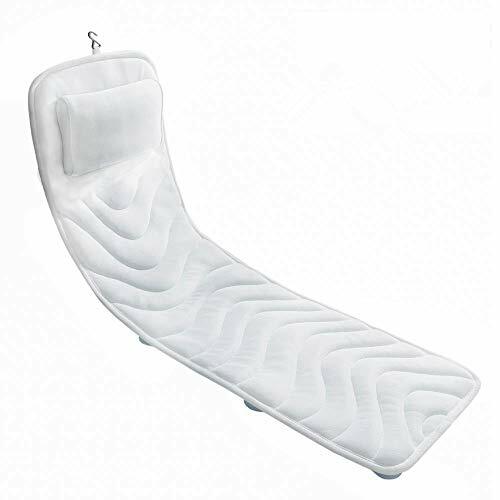 The quilted 3D mesh fabric allows constant airflow which makes this spa pillow dry fast. SIX SUCTIONS CUPS. Other pillows have 3 or 4 suction cups but our product has 6 which keeps it firmly secured on the bathtub. WAVE-PATTERN STITCHES. It provides strategic support for tender, sensitive areas, such as your spine and cervical vertebrae. Plus, it conforms to your body's contours for truly customized cushioning. MOLD/MILDEW RESISTANCE. Open Air Fibers are soft, and mold/mildew resistant. Our pillow comes with a handy hook to allow you to dry when not in use, making this the perfect bathtub accessory. EXTRA-DURABILITY. This bath spa pillow is pretty durable and will last you through a good many uses. 2X-Thick Luxury Foam TM Epica Bath Pillow Are you sick of thin and flimsy pillows that don't give the luxury you are looking for? The Epica Luxury Foam bath pillow will give you DOUBLE THE THICKNESS and foam as any other brand on the market. Beat that! STRONGEST SUCTION CUPS ON THE MARKET Are you tired of suction cups that stick too much and don't come off without breaking apart-or ones that don't stick enough and are unable to support you? Want to scrap your crusty old pillow-the tiny, over-puffed, terrycloth-covered monsters that barely stick to the wall and aren't wide or long enough to truly relax on? Then the Epica Luxury Spa Bath Pillow is fated to become a vital part of your relaxation bath routine. Stop worrying about punctures or rips. Unlike other leading brands, Epica's bath pillow will last for years. Both the exterior and the interior supporting foam dry quickly, letting you use it day in and day out. Sometimes, size does matter. The Epica pillow has the largest, thickest, most powerful suction cups on the market, strategically placed to ensure your head stays perfectly positioned. And removing the pillow is as easy as snapping-simply slide the item up and off. Your favorite hard worker deserves something that works as hard as they do. Our foam not only fits their form perfectly but matches their body temperature, providing a wondrous nest of relaxation. With some soft-light aromatic candles, use this bath pillow to transport them to the spa any day they need it. Scroll up and click the green "Add to Cart" button now! EXCLUSIVE DOUBLE-THICK LUXURY FOAM: Relax in unmatched luxury with the double thick foam of the Epica Spa Pillow. We all want our world to melt away in warm bubble baths. Inspired by luxury pillows used in the highest-end spas, the Epica comfort foam brings warm support to your much-needed downtime. MOST POWERFUL SUCTION CUPS ON THE MARKET: Sometimes, size does matter. The Epica pillow has the largest, thickest, most powerful suction cups on the market, strategically placed to ensure your head stays perfectly positioned. IDEAL FOR ANY PERSON OR TUB: Epica's invigorating two-panel design bends around the edge of the tub, cradling anyone's head, neck and shoulders expertly. The flexible hinge is adaptable to any tub shape, including Roman tubs, air jet tubs and jacuzzis. THE MOST WONDERFUL GIFT: Whether for mother to daughter or anyone in between, be responsible for your loved one getting some real relaxation time in. Give the most comfortable bath pillow for anything from birthdays to bridal parties. OUR REST EASY 10-YEAR COMFORT GUARANTEE: You can rest easy that you're buying the best bath pillow on the market. If you don't believe us after buying, simply contact us. We'll give you your money back NOTE: This pillow is not designed to grip onto textured surfaces. Serenity now...make every moment you have to relax the most enjoyable it can be with the Gorilla Grip spa bath pillow. Here are answers to our customers most frequent questions. How do I secure my bath pillow to my tub? To secure your pillow, moisten the suction cups before gently pressing each cup to the surface of your tub. My bathtub is tiled or textured, will the bath pillow work? We do not recommend this bath pillow for textured or tiled surfaces, as all the suction cups need a smooth surface to work properly. In addition, the suction cups may not secure as well on curved bathtubs. My pillow is cold, how do I warm it up? Simply pour some warm water on the pillow to warm it up. Why won t my bath pillow stay submerged in the water? Our bath pillow is designed to be air tight to ensure that no water gets trapped inside which can cause mold. As a result, it will not stay fully submerged in water. We recommend attaching your pillow at the water line. This should result in a comfortable position for your whole body. How do I remove my bath pillow? To remove your bath pillow, please use your finger to gently loosen each cup individually. Please DO NOT PULL on the bath pillow to avoid damaging it. How do I care for my bath pillow? To clean your bath pillow simply wipe the surface with a soft cloth. Allow to fully air dry between uses. Can the suction cups be removed for cleaning? Yes! To clean your pillow simply pull on each suction cup to remove it. After cleaning, just pop the suction cups back into the pillow. What do I do if the pillow does not fit or stick to my tub? Or if I accidentally damage it? No problem. Please contact us directly for your choice of a refund or exchange. Even if after the Amazon 30 day return window. LARGE THREE PANEL DESIGN: This oversized pillow measures 19.5 x 15 and includes an orthopedic three-panel design.It helps provide suport for your head, shoulder, neck, and back as you recline in your tub. Slow rebound sponge with resilience and breathability. It conforms to your body's contours so you will feel relaxed. 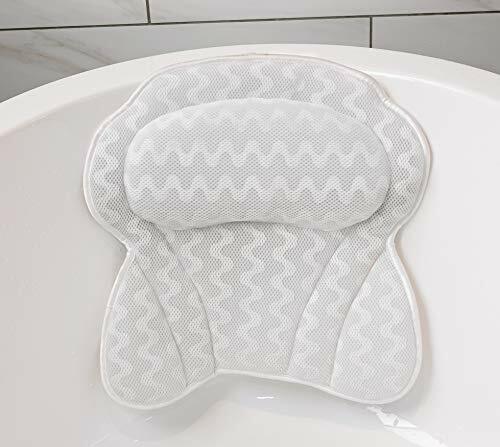 There are 6 suction cups behind the bath neck pillow, the back anti-slip suction cups are powerful enough to adsorbe on the bathtub to make bathing more comfortable and safe. Great for relaxing in bathtubs, hot tubs and whirlpools. Fits for any size tub, spa, or jacuzzi. With hook, it is more convenient to store the bath head pillow. You can hang up the pillow to dry, the reticular layer allow air and moisture to flow through. 3D mesh is made of high quality raw material, comfortable, non-toxic. This luxury bath pillow is suitable for family. The soft material can help you to relieve the tiredness of life. No matter you want to read a book, drink a cup of wine, enjoy bubbles bath, or just simply lay back and relax. Please allow 1-10mm difference due to manual measurement. Enjoy Your Relaxing Bath Time: The perfect combination of bath pillow and bathtub makes you enjoy your bath time, you can read a book, drink a nice cup of wine, enjoy bubbles bath, or just simply lay back and relax. 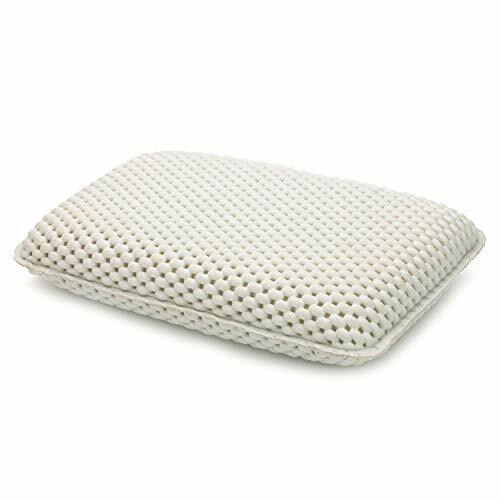 Excellent Design: This spa bath pillow is made of soft fiber and the Shell shape design is comfortable and can support your neck, head and back, it conforms to your body's contours so you will feel relaxed. 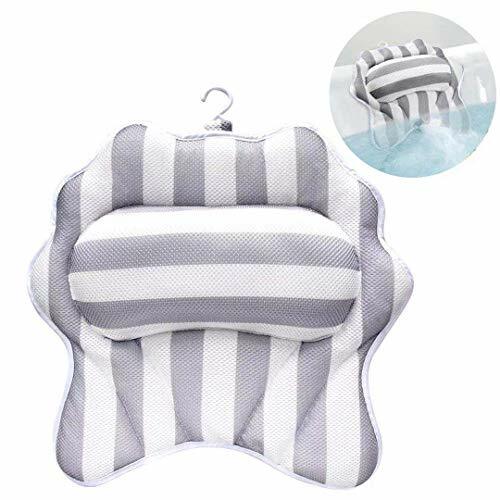 Strong Suction Cups: There are 6 suction cups behind the bath neck pillow, they are powerful enough to adsorb on the bathtub and will not slip around make you feel uncomfortable. It fits most bathtubs. Clean & Place Convenient: With hook, it is more convenient to store the bath head pillow. You can hang the pillow to dry, the reticular layer allow air and moisture to flow through, fast drying. Perfect Gift: This luxury bath pillow is suitable for girls, women, men, kids. The soft material can help you to relieve the tiredness of life. Is my premium pillow non-slip? Yes! Most premium bath pillows on the market only offer 2 or 4 suction cups, but our pillow has 6! We purposely designed our premium bath pillow with you in mind! Reduce pesky slippage and constant re-adjusting your pillow on your tub. Your pillow works best on smooth tub surfaces that are free of dirt and debris. How comfortable is this pillow? Our bath pillow is designed with premium, high-quality 4 thick deluxe foam material and durable construction to ensure you get the maximum support and relief you need for your fatigued and sore muscles. How do I keep clean my pillow? Our premium bath pillow is very easy to clean! Simply hand wash with cold water and use a non-chlorine bleach if necessary. Our pillow will quickly dry on its own. What if I am not happy with my pillow, can I return it? Of Course. We are proud to offer a no-hassle guarantee on our premium bath pillow. We want you to be 100% happy with your new pillow. If you are unhappy for any reason, please contact us directly and we will be happy to assist you with a replacement or a full refund. No hassle, no questions asked. 6 SUCTION CUPS: Why buy a bath pillow with only 4 suction cups when you can have 6?! Our premium bath pillow offers 2 extra suction cups to help your pillow stays in place on most smooth tub surface. Simply moisten each suction before application and press firmly on your tub surface for a secure grip. Plus, we love our customers so much we've included a free bath puff with every purchase! MACHINE WASHABLE: Easy to clean! This pillow can be washed on cold with gentle detergent. Please wash the pillow by itself (without other clothing items). Never use bleach. Always air dry, do not iron. The pillow is carefully constructed with open weave mesh technology that helps stimulate active airflow and fast drying capabilities. This helps to prevent moisture and mildew from forming in your pillow. 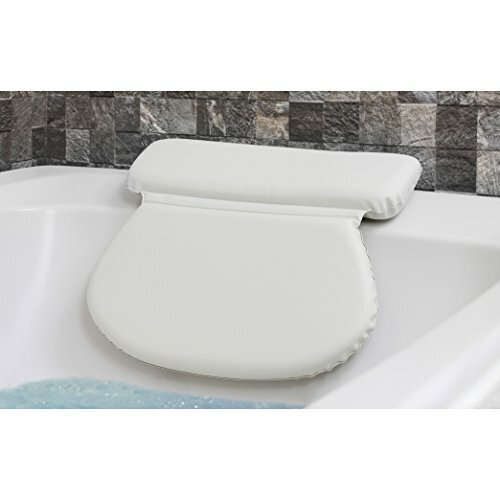 PREMIUM 2-PANEL DESIGN: This pillow measures 14 in x 13 in and features a thick, 2-Panel design that helps to ease neck and shoulder pain as you recline in your tub. LUXURIOUS COMFORT AND SUPPORT: Rest your head and sink your sore neck into our plush, soft premium bath pillow for luxurious comfort and relaxation. Our generous 2-panel, 4 thick design seamlessly contours and supports your head, neck and shoulders to ease those tense and tired muscles after a long day. Perfect for while you're soaking in a bubble bath, jacuzzi, spa and serves as a great gift for women, men, and more. NO HASSLE GUARANTEE: We are proud to offer a no-hassle guarantee on our premium bath pillow. It is our goal to not only provide outstanding customer service, but to ensure you are completely happy with your purchase. If you are not happy with your flag just contact us directly (even if outside the Amazon return window) for a replacement or a full refund. Zero questions asked! Our bath pillows for tub are made with high-density fiber, it supports machine washable, quick-drying and rebound, also a good gift to your family and friends. Our bath pillows for tub are made with 5D double-layer textile mesh, Water permeable mesh layers allow air and moisture to flow through for a super quick dry, no more bad odors, mold, mildew or other bacteria. Unlike skimpier pillows, our bath pillow for tub completely envelops your head, neck, and shoulders... so you can simply lie back and relax in a cloud of cushioned comfort. No more aches and pains. Nothing but soft support all around. 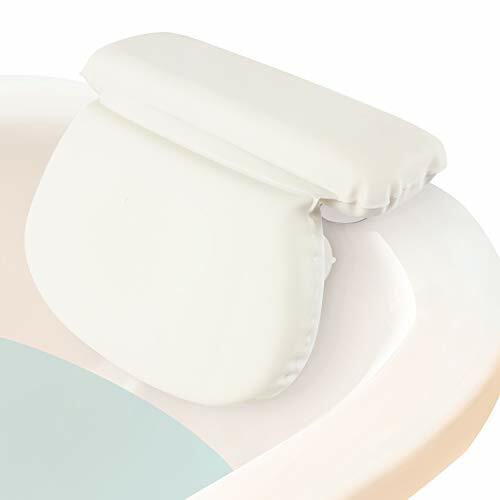 Extra Large Size:17.7" x 17.7"x2.4"
Our bath pillow for tub is vaccum packaging. It would wrinkle when opened. So it is better to clean and dry it before use to restore elasticity. Remove a suction cup by peeling up the sides rather than trying to pull straight from the middle. Click 'Add to Cart' on this bath pillow for yourself or a friend for a gift and enjoy your time . UPGRADED 5D MESH MATERIAL-With 5D double-layer textile mesh, Water permeable mesh layers allow air and moisture to flow through for a super quick dry, no more bad odors, mold, mildew or other bacteria.Unlike skimpier pillows, our bath pillow for tub completely envelops your head, neck, and shoulders... so you can simply lie back and relax in a cloud of cushioned comfort. No more aches and pains. Nothing but soft support all around. GENEROUS SIZE AND OWL SHAPE-Our bath pillow for tub has a generous size (17.7 x 17.7) and pleasant owl shape, it will cradle you while you enjoy your indulging hot bath. Fits any size tub, spa, or jacuzzi. The long top cushion will rest your neck and head, while the main section will support your shoulders and back. 5 SUPER STRONG SUCTION CUPS- Our five suction cups are bigger and thicker than original, which increase the contact area between the cup and the bathtub, so the adsorption is stronger. When fixing of the suction cup, we use hot melt adhesive technology in place of the needle stitching, it is not easy to separate from the bath pillow for tub. PERFECT PRESENT- We send a extra laundry bag and a travel bag to you as gifts. The head is equipped with a detachable humanized hook for easy hanging after clean. Before machine wash, you can put the bathub pillow into the bag then wash. Our bath pillow is ultra-soft and smooth to the touch, with more than 2 of luxurious padded foam. Take a break during this busy time of year and treat yourself to the gift of ultra-comfort! 30 DAYS WARRANTY - Your satisfaction is great honor for us, so we guarantee to offer a free replacement or refund if anything goes wrong about the product within 30 days. Tired of cheaply made bath pillows that are a pain to use? Have you ever used a bath pillow that's so soft it doesn't offer any cushioning whatsoever? How about one that's so firm it's uncomfortable to use for extended periods of time? Frustrating, isn't it? And when you do find one that provides just the right mix of softness and support, it doesn't come fitted with a pillow for your head and neck. Wouldn't it be better if everything you needed to enjoy a nice, relaxing bath came in one product? Enjoy your most relaxing bath yet with the Soothing Company Full Body Bath Pillow! Expertly engineered to be soft enough to offer unparalleled comfort but still firm enough to provide ample support, our spa-grade full body bath pillow is specifically designed to make bath time as relaxing as possible. It also comes fitted with a high-quality ergonomic pillow for your head and neck so you can feel even more comfortable. And when you're done, you won't have to worry about clean up as well. Just wash the product with clean water (soap optional) and let it dry. Its anti-bacterial, mold- and mildew-resistant 3D mesh is designed to be super breathable and quick drying so the product we'll be ready for use again in no time. You can also just throw it in your washing machine-using the included washing bag-for an even more effortless clean up. 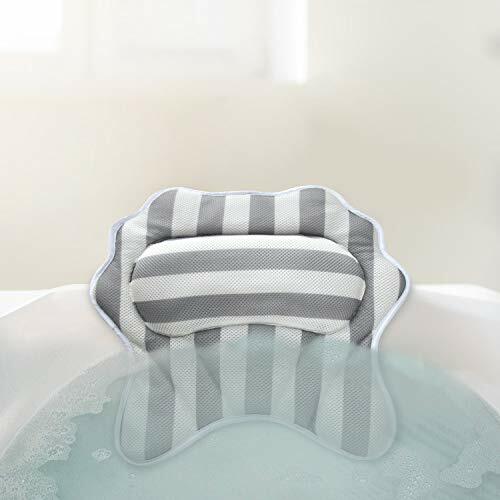 Ample full body support and comfort Anti-bacterial, mold- and mildew-resistant materials and construction Built-in pillow for your head and neck Hassle-free clean up 50-inch one-size-fits-all design Give yourself the gift of super relaxing baths! Add the Soothing Company Full Body Bath Pillow to your cart NOW! 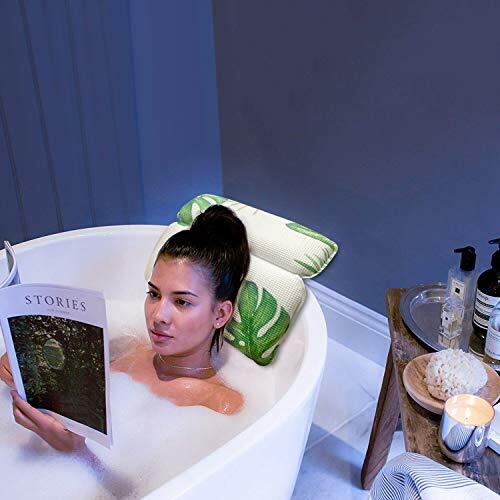 EXPERIENCE UNPARALLELED COMFORT - From the super soft body cushion to the ergonomic headrest for your head and neck, our premium-quality full body bath pillows have everything you need for a truly relaxing bath experience. ENJOY A WORRY FREE BATHING EXPERIENCE - Forget about slips and falls! Our spa-grade full body bath pillow comes fitted with 13 ultra-strong suction cups specifically designed to keep the product firmly in place for the entire duration of your bath. KEEP MOLD AND MILDEW AT BAY - The 3D mesh we use in all our full body bathtub pillows are not only designed to be anti bacterial, but also extremely resistant to mold and mildew formation, thanks to its breathable, quick-drying design. CLEAN UP EASILY - Aside from its anti-bacterial, mold- and mildew-resistant construction, our premium bath pillow is also designed to be super easy to clean with soap and water either by hand or washing machine. 100% SATISFACTION GUARANTEED - Customer satisfaction is our number one priority. So, if you're not totally happy with your Full Body Bath Pillow, just let us know and we'll give you a free replacement or full refund. Order today risk free! ComfySure Full Body Spa Bath Mattress Pillow - Soft Quilted Bathtub Mat with Breathable 3D Mesh Layers - Comfort Head Rest - Non-Slip Suction Cups - 48" x 15"
Extra Breathability STAY SAFE WITH NON-SLIP SUCTION Bathtub floors are known to be slippery, even more so when wet, which presents a risk to young children and the elderly. Our Bath Mattress provides a textured surface for bathers to step on with suction cups on the underside that hold it firmly in place. No more worries about slips or falls when getting in or out of the tub! Rest assured, the ComfySure Bath Mattress is a bath accessory the whole family will use. Safety doesn't end with non-slip. Tired of plastic bath accessories or toys that accumulate mold? Our anti-mildew material stays clean and is also quick-drying. A top hanging loop enables easy storage while facilitating air circulation for even quicker drying. So, why don't you try a ComfySure Bath Mattress today for an optimum bath experience that not only protects your safety, but also relaxes the body and mind? Don't just bathe, rejuvenate! LIKE LAYING ON CLOUDS: With 3D air mesh technology, multiple layers are quilted into this spa bath mattress for silky soft comfort. A built-in headrest lets you lean back and lay down. SPA RELAXATION: This bathtub mattress combines the soft plushness of your bed with soothing hot water and foamy bubbles from the bathtub. Fully relax and calm down taking a bath! HANDY FEATURES: non slip suction cups on the underside hold the mat firmly in place, without it slipping and sliding away. A hanging loop on the end lets you hang it to store compactly. STAYS CLEAN AND DRY: Water permeable layers with extra breathability are also quick drying with anti-mildew protection to keep your mat in good, healthy and mold free condition. LARGE SIZE FITS ALL: At 4 feet long and 15 inches wide (48 x 15), this bath pad accommodates the head, neck and trunk of most adults and kids. A bath accessory for the whole family! 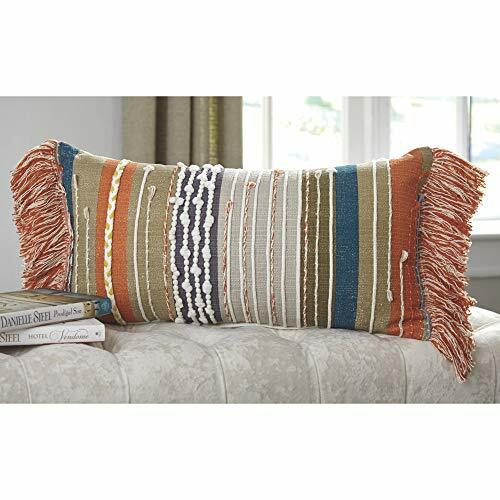 The Dereon kidney accent pillow is bodaciously bohemian. Artfully striped design is teeming with tantalizing texture that is so pleasing to the touch. Pops of orange color invigorate your room with a stylish energy, taking your boho-chic flair to another level. Rest and relax in a comforting bath with the help of a spa pillow. Soft and cushioning, the wide spa pillow is filled with a thick foam to support the head, neck and shoulders for greater comfort. The two-panel, hinged design conforms to the edge of any tub, including garden tubs, spas and jacuzzis and is backed with strong suction cups to eliminate slipping and sliding. Completely waterproof, the sealed spa pillow is reinforced to prevent rips and tears, is mold and mildew resistant and is easy to clean. Rest and relax in comfort with the cushioning spa pillow, supporting the head, neck and shoulders while in the bathtub or spa. The soft, waterproof spa pillow is generously wide and filled with a thick foam interior to provide comfortable cushioning between you and the tub. Constructed with a hinged, two-panel design, the flexible spa pillow conforms to the edge of the tub for optimal cushioning and support. The versatile design provides comfortable cushioning for bathtubs, spas and jacuzzis. Seven strong suctions cups hold the bath pillow in the perfect position for relaxation and rest. Securing to any non-textured tub surface, the suction cup base ensures the pillow will not slip or slide when wet. Mold and mildew-resistant, the durable spa pillow is constructed with a waterproof material that is completely sealed. Each suction cup insertion point is also reinforced to prevent rips and tears. 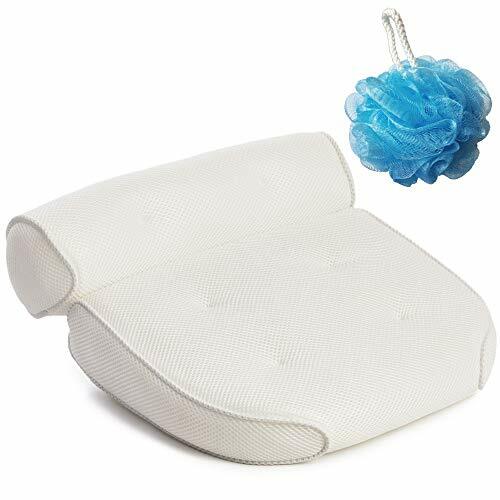 CUSHIONING SPA PILLOW SUPPORT: Rest and relax in comfort with the cushioning spa pillow, supporting the head, neck and shoulders while in the bathtub or spa. The soft, waterproof spa pillow is generously wide and filled with a thick foam interior to provide comfortable cushioning between you and the tub. 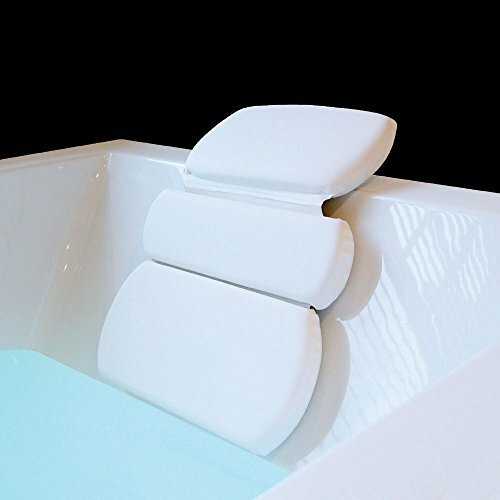 TWO PANEL DESIGN: Constructed with a hinged, two-panel design, the flexible spa pillow conforms to the edge of the tub for optimal cushioning and support. The versatile design provides comfortable cushioning for bathtubs, spas and jacuzzis. SECURE SUCTION CUP: Seven strong suctions cups hold the bath pillow in the perfect position for relaxation and rest. Securing to any non-textured tub surface, the suction cup base ensures the pillow will not slip or slide when wet. REINFORCED WATERPROOF PILLOW: Mold and mildew-resistant, the durable spa pillow is constructed with a waterproof material that is completely sealed. Each suction cup insertion point is also reinforced to prevent rips and tears. VIVE GUARANTEE: 60 day guarantee so you can purchase now with confidence. Unlike skimpier pillows, it completely envelops your head, neck, and shoulders... so you can simply lie back and relax in a cloud of cushioned comfort. No more aches and pains. Nothing but soft support all around. Our pillow is not only smooth and soft to the touch, it's also constructed of thick padded foam that offers an unparalleled level of comfort. Relief for Pressure Points Premium "wave-pattern" stitching provides strategic support for sensitive joints & muscles. Helps prevent aches & soreness. This sumptuous spa pillow envelops your head, neck & shoulders in blissful comfort which is an amazing stress relief ritual. AirMesh Technology With its 3D ventilation, your breathable bath pillow allows constant, refreshing airflow. Dries fast; won't get hot & soggy. Non-slip bath cushion 6 super strong suction cups stick firmly on any tub surface, easy to stick, easy to change the position, easy to remove once you finish enjoying your bath or spa time. Satisfied Guarantee We offer 30days money back and one year warranty. If you are not happy with the bath pillow for any questions , contact us please for full refund . Designed to Make Bathing Comfortable and Relaxing,A Must Have Accessory for Bath Time!!! Fits Any Tub- With 2 Large Powerful Suction Cups Really Grips Your Surface.The Flexible Hinge Is Adaptable To Anyshape Tub,Spa Or Jacuzzi. Perfect For Your Candle Bath Time,Creating A Charming Spa Environment Right In The Comfort Of Your Own Home. Easy to Clean & Dry-Mesh Technology Allows Water&Air Permeability For Quick and Easy Drying. Lightweight & Small Enough,Take The Bath Pillow On A Trip! (1) Please dry the surface of the bathtub before you put the pillow, to make sure there's no water/dust contacting with the suction cups. (2)Press the pillow onto the smooth surface,to make sure the air inside the suction cup is pressed out. (3)Then pour the water into the bath. (1)Machine wash or hand wash in cold/warm water after use. (2)Leave out in the sun or a dry surface for fast drying. (3)Do not tumble dry or iron. If you have any questions or problems,please feel free to contact our customer service email. We will try our best reply you ASAP within 12 hours,and we are always glad to be at your service! 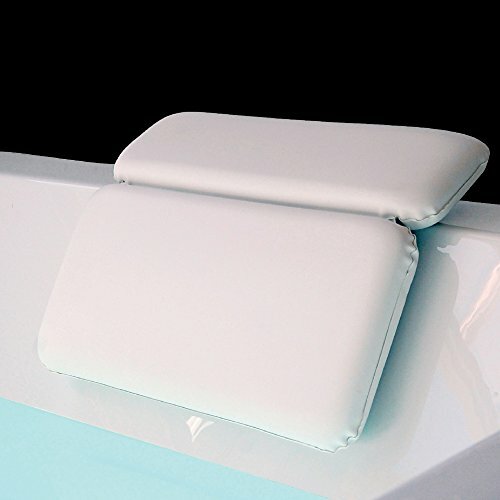 FITS ANY TUB - 2 extra strong and large suction cups that allow this bath pillow stays firmly on any smooth surface,fits any size tub, spa, or jacuzzi.Use the cloud bath pillow anywhere and anytime you want to relax.No worry about slippage.Strong suction cups but easy to remove. EASY TO CLEAN & DRY - This bath pillow is designed with a 3D mesh ventilation technology to allow the water to flow through out the pillow for dry quickly and will not attract mold,dirt or bad smells.Dries fast with super permeability;Won't get hot & soggy.You will soon be able to enjoy a completely luxurious,relaxing and clean bath experience. LIGHT&COMPACT - A lightweight,quick-drying bath pillow that is not bulky.This spa pillow is the perfect size to cradle your head and neck.It's thick and light,you could carry it to swimming pool,hotel,vacation ect.Perfectly compact for convenience and portability.This bath pillow has a squishability quality with a nice mesh covering which seems to dry out well.It's easy to leave on or store away. CLOUD OF SOFTNESS - Unlike inflatable spa bath pillows,our bath pillow cushion is made from luxurious soft material.The ultra soft and smooth to the touch bath pillow cushion provides blissful comfort to help you deeply relax.Super soft pillow offers a comfortable cushioned surface that provides premium head and neck support.This pillow allows your head and neck are fully relaxed,when you take a bath or spa.Machine/hand washable for easy care. A HOME SPA DAY- Our bath pillow makes you every day a spa day.Lying on this spa pillow in the bath,swimming pool or beach.You can get the real relaxation after working,sports and other activities.This beautifully designed spa bath pillow makes a great gift to provide your loved one with some real relaxation.Give the most comfortable bath pillow in any occasion,such as: birthdays,housewarmings or bridal parties etc. Now,take our bath pillow and soar in the ocean of relaxation! PEMENOL Full Body Bathtub Pillow & Bathtub Mat Soft Full Body Spa Bath Mat Bath tub Mattress with Non-Slip Suction Cup and Head Rest Pillow for Neck and Back Support - 49" x 14"
PMENOL Full Body Spa Bath Pillow Mat features breathable, non-slip, soft and lightweight, which can wide use for bathroom, bathtub, balcony, suitable for no matter adults and kids without worrying about falls and slips. Comfortable and soft bath pillow mat make a fully relaxing and luxurious bathing experience, letting you get rid of tiring after all day long work or study. What a cool partner in bath! Why you choose our bath pillows for tub? 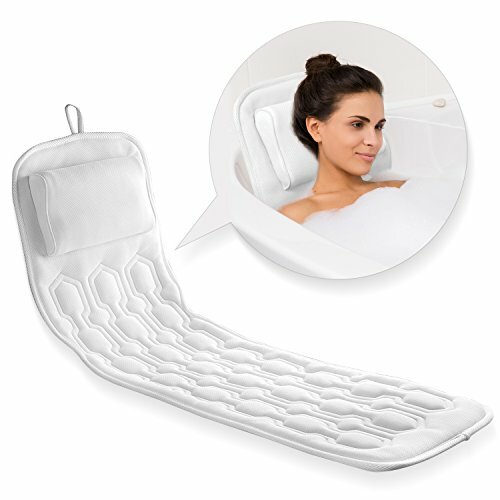 2-IN-1 FULL BODY SPA MAT & PILLOW FOR TUB: The bath tub mat with built-in ergonomic pillow can be used as bath pillow. The headrest lets you lean back and lay down to take the pressure off your tailbone and back, helping prevent aches & soreness, truly enjoying bath spa. 3D AIR MESH TECHNOLOGY: Adoption of 3D air mesh technology, this bath mats for tub features water permeable and tremendous breathability, which allows water & air to flow through for quick drying, effectively prevents bad odor from forming in and around your pillow, ensuring health of skin. 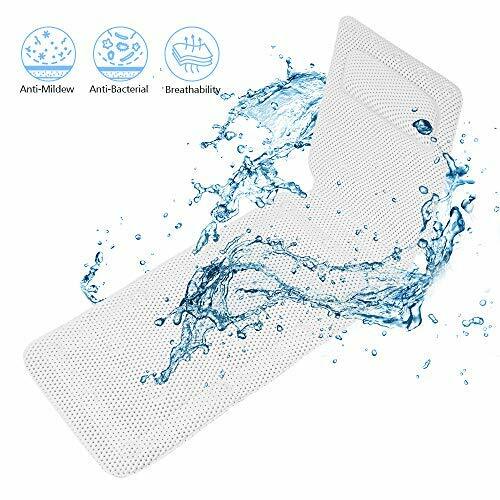 NON-SLIP BATH TUB MAT: Comes fitted with 30 ultra-strong suction cups, this bath tub pillow can be firmly fixed to any smooth surfaces, you won't never worry about slips and falls no matter when bathing or getting in or out of the tub. It can also eliminate common and irritating pillow slippage, ensuring head stays perfectly positioned to enjoy the most relaxing bathing experience. EASY TO WASH AND CARE: Made of water permeable and breathability mesh material, our full body bath pillow can be simply wiped by soap lightly and washed by water or washing machine. You can use wash bag (included)while washing in machine to protects the pillow from snags or from suction cups sticking to the side of the machine. Extra hanging hook design for easy drying or storage. COMFORTABLE & PERFECT GIFT: 49 x 14 bath mat for tub is suitable for most adults and kids and accommodates their head, neck, shoulders, back, and tailbone in blissful comfort. Multiple layers of spa pillow brings silky soft comfort, the soft plushness combines with soothing hot water and foamy bubbles from the bathtub,to make a fully relaxing and luxurious bathing experience. What a cool gift for your friends and family, especially for joint pain. HIGH-QUALITY MATERIALS: Polyester, soft and stretchy and lightweight Fabric,make the dress elegant, flexible, comfortable to wear. DESIGN FEATURES: O-Neck Strapless Polka Dot Casual Short Sleeve design, as a small dress to show elegance, as a casual casual wear, full of fashion and style. PERFECT MATCH: Loose dress perfect with a necklace or a pair of boots or sneakers makes you look slimmer and more energetic. NOTE SIZE: There are four sizes to choose from: S/M/L/XL. Before ordering, please read the size chart provided in the previous picture and select the size according to it. Color: White andamp; green Material: PVC foam Size: L*W*H: 37*29*5cm(14.57*11.42*1.97in) Package Including: 1 x Bath pillow Note: - Package includes only one bath pillow. - Please refer to the measurement. Tiny measuring error is allowable in normal range. - There might be a little color difference due to the monitor, camera or other factors, please refer to the physical item. Kapmore turtle leaf bath pillow with new luxury design is perfect as a gift for yourself, friends, family, etc. Material: Polyester. Stretchy, Soft and Comfortable to wear. Features: Casual loose fit, Crew neck, Pleated, Flower Printed. 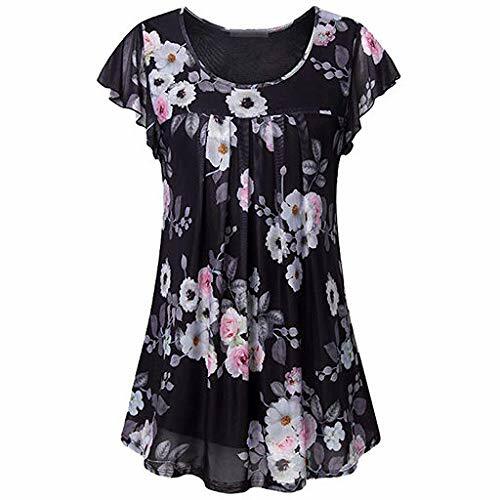 Occasion: Colorful Flower print design makes this tunic shirt vibrant and glamorous Suitable for casual daily wear, travel, home, work, sports and so on. Matching You can wear this top with tight leggings, jeans and boots. Or, when it gets cold, you can wear a blazer, jacket or cardigan. Satisfaction Guaranteed This is the Asian size Dimensions tend to be small, so if the size is between the sizes, order a larger shirt. Please read the size chart below carefully before purchasing.If you are not satisfied with the fit, please contact us immediately and we will provide better service!